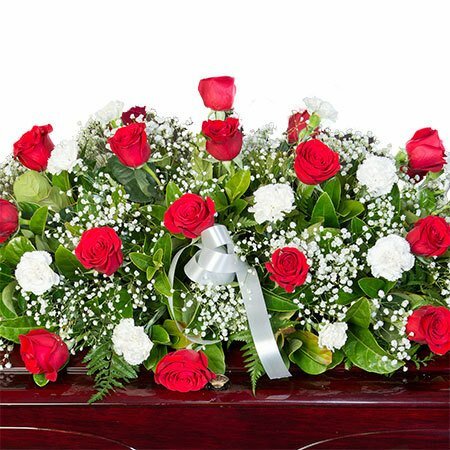 A classic, traditional funeral casket arrangement of red roses and white carnations, soft white babies breath, and lush greenery. This floral design offers a beautiful, symbolic colour combination of red flowers for love and white flowers for peace and eternity. To arrange your funeral casket flowers simply place your order via our online florist shop or give our helpful consultants a call on 1800 66 66 46. 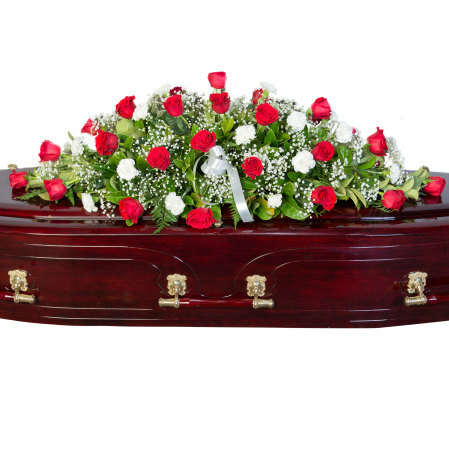 *Please note: The pictured casket flowers are exclusive to Sydney only. For funeral flowers outside Sydney, our team will coordinate your order via an affiliate florist network to recreate our design and colours as closely as possible.